Starring Melissa Benoist as the title character, the CW Network's Supergirl showcases the classic DC Comics superhero---who is one of the last surviving Kryptonians and Superman's cousin. 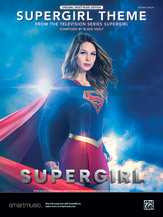 This Original Sheet Music Edition presents a solo piano arrangement of the Supergirl theme, complete with original artwork. This title is available in SmartMusic.